After the roaring success of their first, sell-out night, Nick Gilkinson's The Potlatch pop-up is back for another dinner, this time in Clerkenwell, with Edoardo Pellicano, currently Sous Chef at Portland. The five course dinner will include dishes like Boneless Chicken Wing, Roasted Chicken & Ginger Jus and Blackface Lamb with Ramson, Pearl Barley and Roscoff Onions, and tickets cost £55. 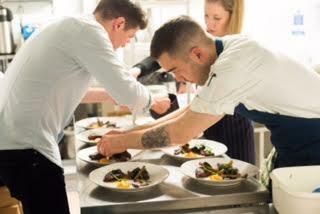 "Following on from the launch of his first pop-up restaurant, Nick Gilkinson will again showcase his vision and style of hospitality this April 13th by collaborating with another of London’s best kitchen talents - Edoardo Pellicano, currently Sous Chef at Portland and who previously worked alongside Nuno Mendes at Viajante - with an all-inclusive food and drink menu at £55 per head. Fresh from The Potlatch’s sold-out launch night in March, the restaurant moves further into town by taking over The Clerkenwell Kitchen, who specialise in organic and free-range produce. Gilkinson has again uncovered a selection of lesser known wines from natural and traditional winemakers which will be unlimited on the night. Pellicano’s set menu will draw on inspiration from his time at Portland and Viajante as well as his time at Noma and Locanda Locatelli. After enjoying a welcome cocktail designed by Gilkinson, guests will enjoy three snacks including BBQ glazed Eel, Cultured Cream, Fermented Turnip and English Wasabi. Pellicano’s talent will be showcased through four courses, including Biancoperla Cornmeal, Seared Langoustine, Boneless Chicken Wing, Roasted Chicken & Ginger Jus and Blackface Lamb with Ramson, Pearl Barley and Roscoff Onions. For those with a sweet tooth, guests will then enjoy dessert followed by petit fours."